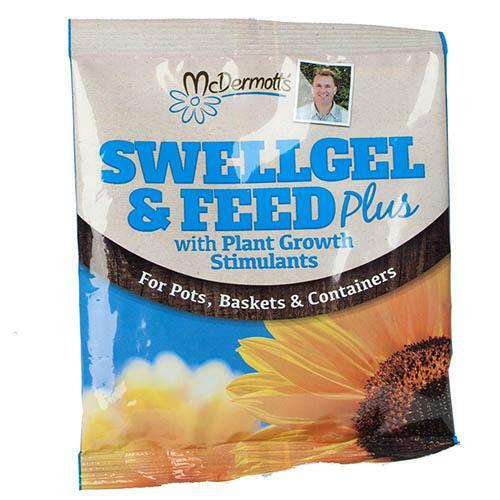 McDermotts SwellGel Feed PLUS is the complete food and drink for your plants and hanging baskets. A true garden essential, it contains a specially formulated high water absorption crystal, which locks in water and swells up to a gel in your hanging baskets, tubs and pots. The multi-coloured granules contain some of the very best slow release fertiliser, and will feed your plants over a period of 6 whole months. For best results, mix in at planting out and filling your baskets, containers, growbags and pots indoors and outdoors. Supplied as a resealable 500g tub, which treats about 25 or so standard hanging baskets or similar sized pots for one season. This brand new and exclusive product represents the very best of commercial plant food and water retention technology and is based on over 25 years of Peters hands on experience of growing plants within the horticultural sector. McDermotts SwellGel & Feed PLUS is the complete food and drink for your plants and hanging baskets, and has been specially formulated to work even better than its next best competitor! A true garden essential, it contains an especially formulated high water absorption crystal, which locks in water and swells up to a gel in your hanging baskets, tubs and pots. Just a few scoops per hanging basket holds about a litre of water for your plants, so they do not dry out in summer, meaning less water used, less time watering and better results as all that water is locked in to the root system, where it can be used to keep your plants flourishing. The multi-coloured granules contain some of the very best slow release fertiliser, and will feed your plants over a period of 6 whole months. Each granule contains a small dose of balanced fertiliser, slowly feeding your plants roots. Best of all, this unique formulation includes naturally occurring Humic Acid the completely natural way to look after the secret root system of your plant, that is a proven plant tonic encouraging even healthier natural growth, which has been found to improve overall plant health, disease resistance and vigour. For best results, mix in at planting out and filling your baskets, containers, growbags and pots indoors and outdoors. Supplied as a 500g tub, which treats about 25 or so standard hanging baskets or similar sized pots for one season. This 500g tub is resealable and comes with a free measuring scoop to ensure you get the perfect mixture, and will last for 3 years or more if the lid is kept on and the contents dry. 30g trial sachet of fertiliser.